Fish in an aquarium are often subjected to changes in water temperature caused by the ambient temperature of the room going up and down according to day and night cycles of your HVAC system as well as heat generated by the equipment that you are using to control the filtration and lighting systems. Many hobbyists do not know that the temperature inversely affects the amounts of dissolved oxygen in the water. Higher temperature equals lower oxygen. Additionally, higher temperatures encourage more waste production. Aquarium fish that receive shocks to their systems from temperature fluxuations will exhibit compromised immune systems, leaving them susceptible to parasitic and other infections such as ich. Most novices know that they need a heater to keep the aquarium warm in an air-conditioned room or during winter cold spells (average 3-5 watts of heat per gallon of water). However, many people do not take into account the need for a chiller during the warm season, or when they are using high-powered lighting and filtering equipment. 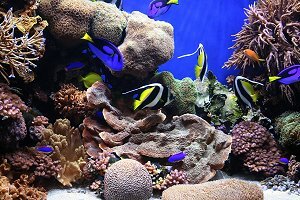 Of particular sensitivity are marine and reef tanks. Experienced aquarists agree that the only way to keep a reef tank cool while providing enough lighting for vibrant corals is to use a chiller. Drop-in chillers are the easiest to install and need the least amount of room. In-line chillers use cooling coils much like refrigerators use. Water passes directly through them over the coils. They need special plumbing and more space. It is best to pre-plan the addition of a chiller into your system before you set the whole thing up since the chiller itself needs significant room around it for ventilation and can actually add heat to an enclosed space. Often times, a chiller cannot be placed in a closed aquarium stand because of the amount of heat generated by the chiller itself and directly dissipated into the aquarium. An open-backed stand can sometimes be used (depending on the size of the chiller). If necessary, put a small fan into the open-back stand to push heated air out. It should be powerful enough to send the heated air away from the area surrounding the tank. It is best mounted to send air out the side of the stand (a hole will need to be cut for this purpose) so that it does not get trapped behind the aquarium between the tank and the wall, where it will raise the water temperature anyway. Some experienced aquarists have made great use of computer fans mounted into the side walls of the stand using a small, unobtrusive hole and these tiny, powerful fans. Set a slow water flow rate through the chiller to give the water the longest contact with the coils to cool most efficiently.